The spirit of Butte's Chinatown hides in the shadows of China Alley, the narrow two-block passageway running from Galena Street to Silver Street that was once the center of the bustling neighborhood. The Pekin Noodle Parlor, a fixture since the 1880s, stands at the top of the alley. At its peak, between four hundred and six hundred Chinese lived and worked in the two-square-block area. Now crumbling buildings, their China Alley entrances boarded-up or bricked-in, are all that remain of the once bustling Chinatown. In 1991 concerned Butte residents formed the Mai Wah Society dedicated to preserving the history of Butte's Chinese community. 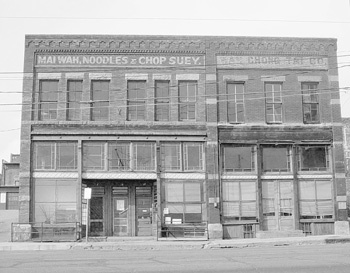 That year two buildings considered the heart of Chinatown-the Wah Chong Tai Company and Mai Wah Noodle Parlor-were on the verge of being sold for back taxes. The society acquired them, and in the thirteen years since, volunteers have worked tirelessly to rehabilitate the buildings and inform locals and tourists alike about the rich history of the Chinese communities in Montana and the greater West. Between 1848 and 1882 over three hundred thousand Chinese immigrated to the United States. The first Chinese immigrants-many of them forced to leave the southeastern province of Kwangtung because of bleak economic conditions, civil war, and a corrupt government-labored in the California goldfields. Later immigrants found jobs on the Central Pacific Railroad, which employed nearly seventeen thousand Chinese before its completion in 1869. The tide of Chinese immigration ended in 1882 with the passage of the Chinese Exclusion Act that prohibited laborers from entering the country for ten years and prevented those already here from becoming naturalized citizens. The only exemptions were merchants and their wives. Congress renewed the law in 1892 and ten years later indefinitely barred laborers. This law remained in place until 1943 when the Seventy-eighth Congress established an annual quota of 105 Chinese immigrants. The history of the Chinese in Butte stretches back to 1868 with the establishment of the first placer gold mines. Eventually, some two thousand Chinese placer miners worked and lived in German Gulch, French Gulch, Rocker, Pioneer City, Bannack, and Alder Gulch. Forced out of mining by discriminatory taxation, threats, and ordinances stemming from the fear of cheap labor, the Chinese opened service-oriented businesses such as laundries and mercantiles in booming Butte, a supply hub for surrounding communities. The economic depressions of the 1870s and the 1890s exacerbated anti-Chinese tensions, leading to riots and the boycotting of Chinese businesses across the country. In 1895 Butte labor unions and the chamber of commerce instituted a citywide boycott of Chinese-owned businesses that threatened to destroy the Chinese community. Led by respected Chinese physician Dr. Huie Pock, Chinese businessmen sued the labor unions and eventually won, though they received no compensation for their lost business. 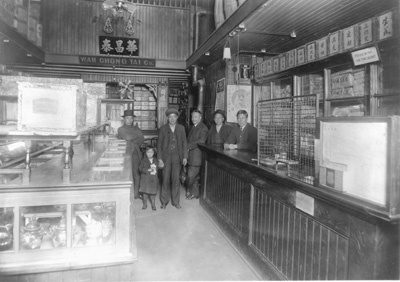 Despite such hostilities, Chin Chun Hock, founder of Seattle's oldest Chinese mercantile, opened a branch store in Butte on West Galena Street about 1893. When Hock visited Butte in October 1898, he announced plans to construct a new building for the Wah Chong Tai Company on China Alley. The company moved into its two-story brick building at 15 West Mercury Street the next year. Wah Chong Tai-meaning "announcing beautiful old China"-served as a hub of the Chinese community, accommodating a mercantile, post office, and bank within its walls. The company also helped procure lodging and jobs for recent immigrants. The mercantile operated from a large room in the front of the building and sold goods imported from China to a Chinese and Euramerican clientele. A balcony above the mezzanine displayed the porcelain, clothing, and other goods offered for sale. An herbal store was located in the rear of the building. Accessed from a door on China Alley, the second floor housed a restaurant catering solely to Chinese patrons. Even today the building retains an amazing degree of integrity. The mezzanine and display balcony remain just as they were when the Wah Chong Tai served Butte's Chinese community. Constructed in 1909, the Mai Wah Noodle Parlor adjoins the Wah Chong Tai to the west. Its first ?oor housed an arcade of shops, and the upstairs noodle parlor served a mixture of Mandarin- and American-style dishes until 1941. Sandwiched between the second-floor restaurant and first-floor shops is a "cheater" story, a labyrinth of rooms that once housed retail shops and low-ceilinged apartments. Stepping into the brilliantly painted red and yellow interior of the Mai Wah building, the visitor is transported to Chinatown. The rough plank floor bears signs of the thousands of feet that clattered through the front door en route to the shops scattered throughout the two buildings. On the second-floor, the kitchen's pressed-tin ceiling is blackened with soot from the preparation of countless meals. The icebox and the stove with its three mammoth caverns meant to fit the woks stand in their original positions. The decline of Butte's Chinatown that began in 1895 continued steadily for the next four decades as residents left to seek their fortunes in San Francisco and other cities where Chinatowns still flourished. By 1940 only ninety-two Chinese lived in Butte. As people sold their valuable Chinatown property, the neighborhood inexorably lost its Chinese influence. Today there are few reminders of Butte's Chinese heritage, but one of them is the annual Chinese New Year celebration, billed as "the shortest, loudest Chinese New Year Parade in the world." Leading the annual parade is Montana's only Chinese parade dragon, Taiwan's gift to the Mai Wah Society in 1998. As it winds through the streets greeting residents and tourists, the dragon bestows blessings of prosperity and happiness to all it encounters. The Mai Wah Society museum located at 17 West Mercury Street is open from May to September. In 2004 the museum plans to launch its first permanent exhibit, The Chinese Experience in the West, to showcase items from its collection, the first public display of these artifacts. To learn more about the Mai Wah Society and museum, including the 2004 schedule, visit www.maiwah.org. CARRIE SCHNEIDER is a former Mai Wah Society volunteer and a graduate of the Museum Studies program at the University of Nebraska-Lincoln. All rights reserved, © 2004.